A tasty treat for breakfast or brunch! 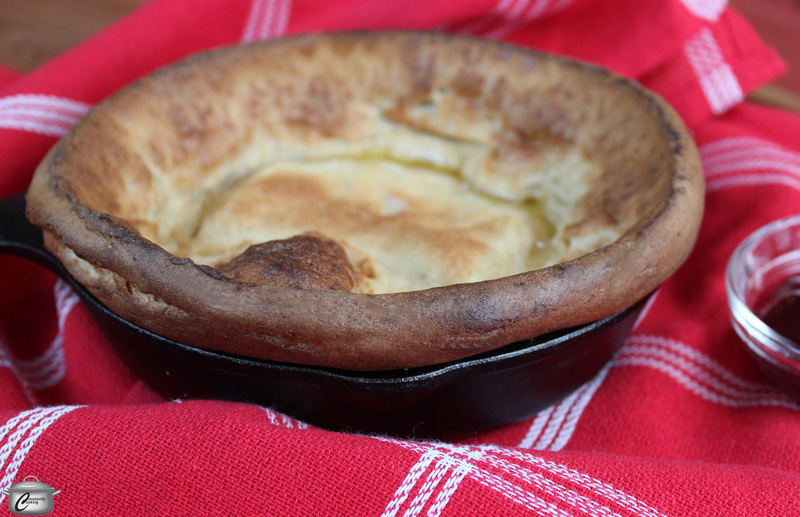 Similar in texture to popovers or Yorkshire pudding, Dutch babies are a great alternative to traditional pancakes. The batter puffs up beautifully while baking, giving the Dutch baby a delicate texture to match its light flavour. You can vary the spices to suit your tastes; my family just loves this chai-inspired version. You can prepare the batter the night before, but be sure to whisk it well just before adding it to the hot pan. In a small bowl, stir together sugar and cinnamon for the topping and set aside. Take any other toppings you enjoy (jam, fresh lemon wedges or maple syrup, for example) out of the fridge to warm up a little. Put the milk and star anise in a glass measure (or small pot) and heat until just warm but not boiling. Remove from heat and let sit so the milk gets infused with the star anise flavour. Place a 10-inch oven proof frying pan (cast iron is best) on the stove, over medium heat. Add half the melted butter to the frying pan and swirl it around to coat the bottom and sides of the pan. Remove from heat. Strain the milk and discard the star anise. Put the eggs in a blender (or use an immersion blender) along with the milk, brown sugar, remaining butter, vanilla and spices. Blend until smooth and a little bit frothy. Add flour and use the blender to pulse the mixture until it is smooth and does not have any lumps. Note that the consistency should be fairly thin, more like a crepe batter than a traditional pancake batter. Reheat the frying pan over medium heat for about 2 minutes before pouring the batter into the pan. Right away, transfer the pan to the preheated oven and bake for 18 – 22 minutes. It will be puffy and golden brown on top when cooked. Remove the pan from the oven and immediately sprinkle the Dutch baby with the reserved cinnamon and sugar mixture. Note that it will begin to deflate almost immediately – this is normal and does not affect the taste. Slice and serve hot with your choice of accompaniments. 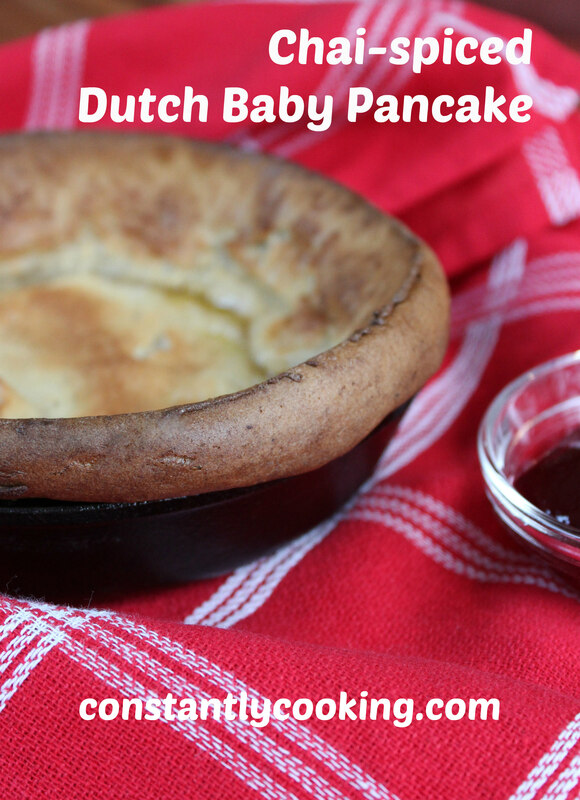 Note: you can also use this recipe to make three individual Dutch babies if you have smaller (6 inch) cast iron skillets. Divide the batter evenly among the hot, buttered skillets and bake for 15 – 18 minutes. This entry was posted in baking, Breakfast, brunch and tagged breakfast popover, cardamom, chai spices, different kinds of pancakes, Dutch Baby, German pancake, oven pancake, Paula Roy, puffed pancake, what to make for brunch. Bookmark the permalink.